As 2012 closes out, so does the first year of this blog. I started the year out with a pregnant wife about to give birth, and what do I do? I start yet another blog dedicated to reading and writing while we have a baby to take care of. I must have been crazy. Well, I’m loving doing this blog. So what happened in 2012? I finished reading 14 books, most of them in the second half of the year. I set a target of 12 books and I exceeded it. I’ll go for 25 next year. 2012 was also the year that I finally became serious about writing books. I’ve developed so many ideas, though I’m going to concentrate on only 2 of them for now. I decided to try out self-publishing through Amazon’s Kindle and Smashwords. I’ve been working on using social media to get myself known. I still have a lot of work to do on that. This is a pretty easy topic. There’s one book I was completely enthralled by, and that would have to be A Game of Thrones by George R. R. Martin. I found it refreshing to read, although it took me a long time. I started reading 3 big epic fantasy series this year, and A Song of Fire and Ice seems to be leading the pack (the others are Wheel of Time and Malazan Book of the Fallen). This is a really difficult choice to make. I didn’t read any bad books. I enjoyed every book I read. However, I would have to choose Gunship by John Davis. It’s not that it’s bad, it’s just that it’s a simple, action oriented book with little depth. I don’t intend to stop anyone from reading it, I think it was a good, light read. I do recommend reading it, by all means. But the main thing that didn’t impress me was the lack of editing. Which Shakespearean play should I read? – This was a poll I ran to choose a Shakespearean play to read. Macbeth won. What’s the greatest epic fantasy series? – A question for my readers. Of course, go there and leave a comment! What is an advanced society? – Are we advanced? See what I say. What should I read next? – Another poll to ask what I should read. Book Review – 2001: A Space Odyssey – My most popular review. Wow! Moment: Killer whales – An incredible event in my life. My dream writing studio – This is mine, what’s yours? Why are people afraid of gay marriage? – No reason to be afraid. A bright comet for 2013 – I’m really looking forward to this! Another poll. What should I read? – Yup, a poll. Book Review – A Game of Thrones – My second most popular review. Random things you may not know about me – Go ahead, find out a bit about me. Poll: the Sequel – Another poll! These are some other posts I think you really should read! My SF world teaser – I’m writing a science fiction novel. Here’s a bit about my world. I am a Geek – Yes, I am. And I’m proud of it! What does an earthquake feel like? – I’ve been through many earthquakes in Japan. This is what it feels like to be in one. Who are you? – I actually just posted this today. I still think you should read it and post your comment. The evolution of alien species – What do you do when you create an alien world? Goodreads and giving reviews – I suggest to anyone who likes books to join Goodreads! World creation, development, and planning – This is a big topic, and I think well worth the read. Well, that’s about it for 2012. I’m looking forward to 2013, and hopefully a published book! Thanks for reading, everyone! I often wonder who my readers are. I wonder what you’re like. I wonder where you’re from, what you do, what you enjoy reading. Why did you come here? And then I look way down at the bottom. These are the countries with only 1 single visitor: Colombia, Croatia, Finland, Nigeria, Chile, Saudi Arabia, Israel, Belarus, Jordan, Argentina, Belgium, Kenya, Moldova, Sri Lanka, Bosnia and Herzegovina, Lithuania, Venezuela, and Barbados. It’s all very interesting to see where I’m popular in. Of course, my target audience is the English speaking world, so it’s no surprise that USA is number 1. I’m from Canada, so a lot of my Canadian readers would be friends and family. UK and Australia are also a big target. But number 2 is Japan. I live in Japan, and I know that many other expats living in Japan read this blog, as well as my Japan blog. But who are you? I want to get to know my readers. Let’s talk. I’m very curious about everyone. Where are you reading this blog from? Home? Library? On your smartphone in the bus? Where? And finally, do you have a blog or website? Of course, you can add anything else you like. I look forward to reading your comments! I’m currently on day 2 of an 8 day holiday. It’s still early, but I’m sure it’ll all go by very quickly. So how will I spend it? Apart from one day at the in-laws’ houses, I’ll be spending most days at home, and a lot of time reading, writing, and blogging. For the short term, I have plenty of posts about writing to write, two books to finish and review, and I’ll do a lot of work on improving how I use social media. I will also be doing some serious book writing! For slightly longer term, I have joined The 2013 Science Fiction Experience (and review site). For 2 months from January 1st to February 28th, it’s a way for people to discuss science fiction and post reviews. I have two sci-fi books nearly finished, so they’ll be up there pretty quickly, I think. Also, I have my own big challenge. I intend to make at least 5 blog posts a week, with a goal of making one a day. I’m pretty sure it’ll be difficult to do it perfectly, so I’m setting my target at 5 a week. The posts will be about writing, my books, reviews (books, sci-fi TV, and food), and possibly even interviews and highlighting other review or books sites. Finally, I have been nominated for a couple of blogger awards, so I’ll be making the appropriate posts in the near future. And before I forget, on the 31st, I’ll be making a year in review post. Here’s to a great 2013! I love sushi. Living in Japan, I get to eat plenty of it. 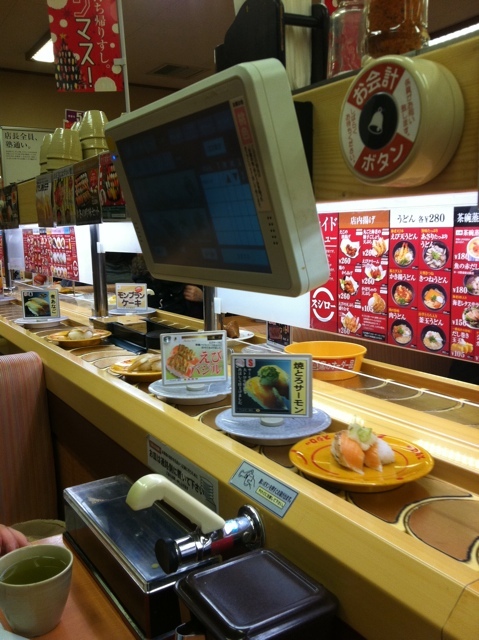 And what’s great is kaitenzushi, or conveyor belt sushi. 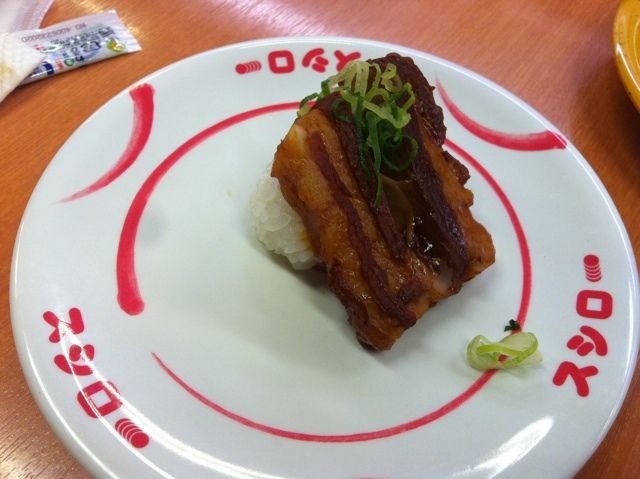 It’s very cheap, only 105 yen per plate, and very easy to fill yourself up. While it’s not the highest quality sushi, it still tastes good. 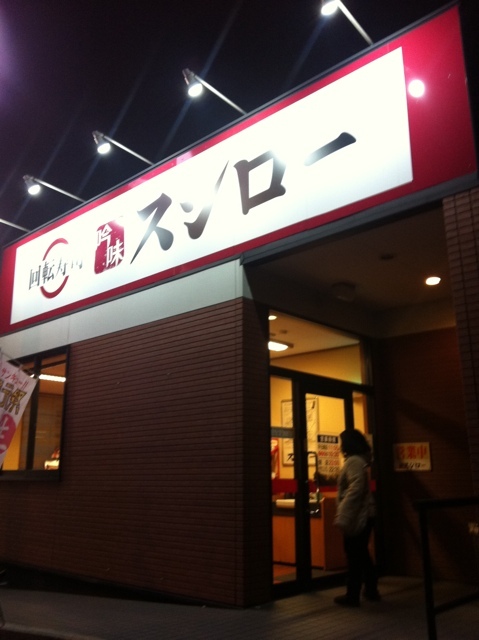 One such restaurant is Sushiro (スシロー). It’s a chain, and during the evening, it is very busy. This particular Sushiro is in the Ishikawa area of Fujisawa. Sushiro has a big selection of sushi to sample. You can try the traditional types of nigiri sushi, such as salmon, tuna, shrimp, squid, salmon roe, and more. I started with some salmon, tuna, and shrimp. 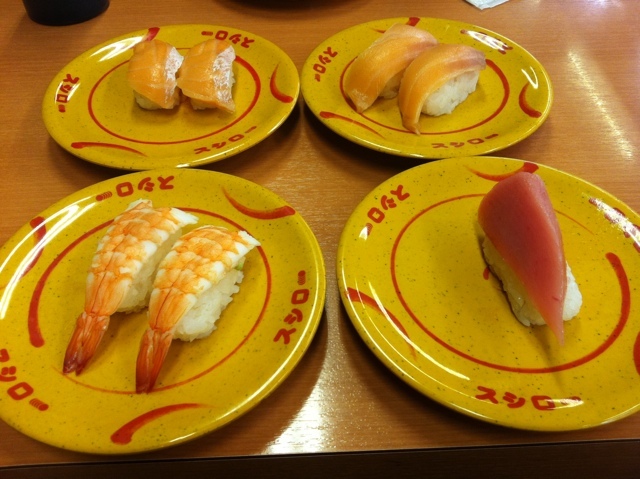 The top plates are salmon, bottom left is shrimp, and bottom right is chuu toro (medium fatty tuna). There are two ways to get your sushi. One is to just grab a plate from the conveyor belt that goes past your booth. Just don”t take any that are on special coloured plates. Those are reserved foods that are being delivered to a specific table. You order those by using the touch panel screen. Touch panel menu and conveyor belt. While there are many traditional types of sushi, there are also some special, non-traditional sushi available. I especially like the kalbi (pork rib meat) and shrimp tempura. Kalbi sushi. I love this stuff. 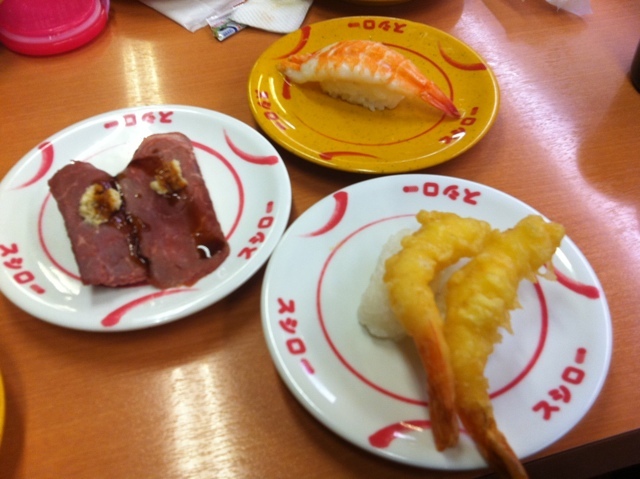 Top is more shrimp sushi, then roast beef on the left, and shrimp tempura on the right. At only 105 yen per piece, it’s a very good value. A full meal for two people can cost around 3000 yen. Also available are drinks, dessert (chocolate cake, ice cream, sweet potato, and more), and tako karaage (deep friend octopus). I highly recommend it, not just for the sushi, but mostly for the experience. 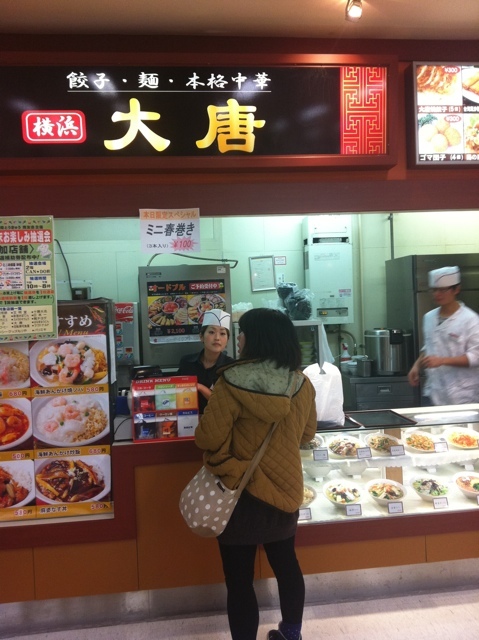 On Friday, I had some fairly average tasting Chinese food at Yokohama Daitou (横浜大唐) in the Shonan Fujisawa Tokyu Store. 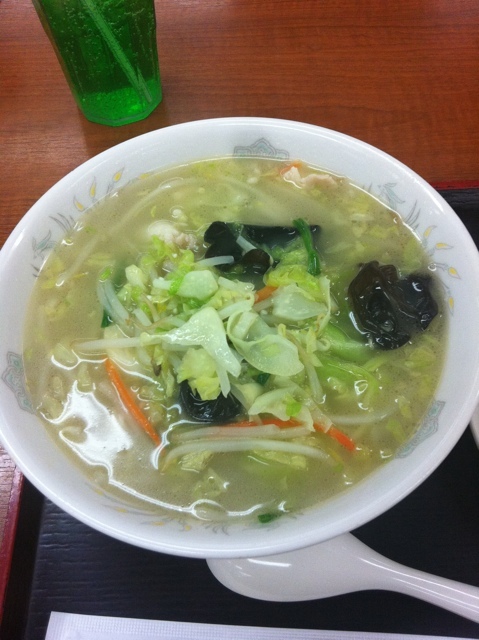 I had the Yasai Tanmen (野菜タンメン). It was a light flavoured ramen with vegetables and pork. It tasted decent, but the serving size was quite large. 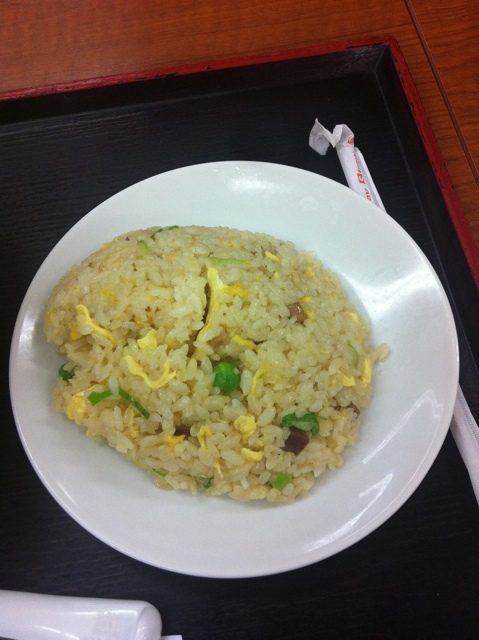 It came with a half serving of fried rice. That was good, I thought. This was all for 680 yen. 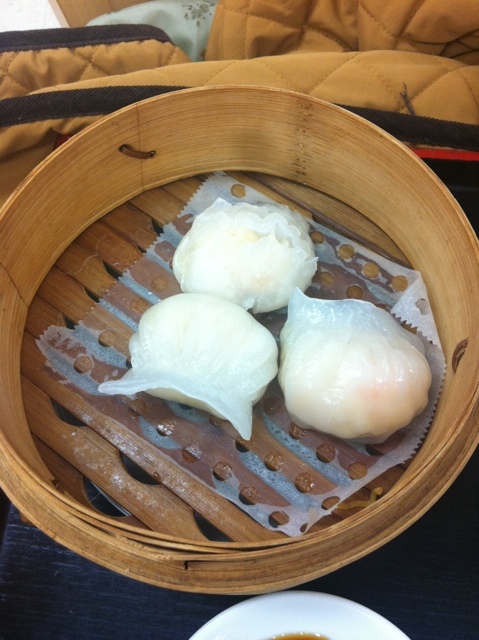 In addition to that, I also had Ebimushi Gyoza (海老蒸し餃子), or steamed shrimp dumpling. It came with soy sauce and Japan’s very spicy mustard. It was also good. That was 300 yen. All of this was too much food. I was very full. This is a food court restaurant. As I’ve mentioned before, the world I’m basing my books on is orbiting a star that actually exists. Now, I’m going to give some extra technical information about the star to give you some more clues about what it is. It’s a G0 V star, meaning it’s a G-type star, somewhat similar to our sun, and it’s a main sequence star. It’s slightly larger and more luminous than our sun, as well. However, it is younger, at about 3 billion years old. It’s less than 30 light years away, and is the brightest star in its constellation. However, it is not the alpha star in its constellation. As I said before, the star does have an Arabic name, though it’s not commonly used. Please check my previous post about this for more information. So, does this help you? Any idea which star this is? Can you guess the name of the planet, too? Leave your guesses in the comments!